2010 marks the 450th anniversary of the Scottish Reformation, which was led by John Knox. Knox had been born at Haddington near Edinburgh and was educated at Haddington Grammar School and St Andrews University. At the time of his birth, Scotland was under the tyranny of Roman Catholic superstition and ignorance, by the time of his death in 1572, Scotland had a Biblical Church which was transforming the nation into a people characterised by piety and godliness. Thomas Carlyle wrote: ï¿½This that Knox did for his nation we may really call a resurrection as from deathï¿½. An early witness to Biblical truth in Scotland, Patrick Hamilton had been burnt at the stake by the Church of Rome in 1528. However by 1540 many of the common people and some of the nobility had embraced the reformed faith. Crowds had flocked to the preaching of George Wishart who had started to preach in the open air. Wishart became convinced that Scotland would be illuminated with the light of the Gospel ï¿½as clearly as ever was any realm since the days of the apostlesï¿½. 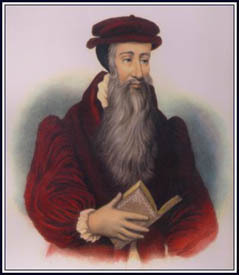 John Knox acted as a bodyguard to Wishart and accompanied him across Scotland. On 1 March 1546, Wishart was burned at the stake at St Andrews, at the behest of Cardinal David Beaton, the Archbishop of St Andrews. By 1547 Knox was living as a refugee with other Protestants in the Castle of St Andrews and it was here that he was called to preach the gospel. In his first sermon in the Castle he explained the antichristian nature of the papacy and said that ï¿½in the worship of God, and especially in the administration of the sacraments, the rule prescribed in the Scriptures is to be observed, without addition or diminution; and that the Church has no right to devise religious ceremoniesï¿½. Following the surrender of the Castle, Knox was imprisoned on a French galley for 19 months. While a galley slave, Knox was presented with an image of the Virgin Mary to worship. His response was ï¿½Trouble me not, such an idol is accursed and therefore I will not touch itï¿½. When the image was violently pressed into his hands, Knox threw it overboard, saying ï¿½Let he save herself; she is light enough; let her learn to swimï¿½. On being released he settled in England where he preached in Berwick and Newcastle, and was appointed as a Royal Chaplain to King Edward VI. He was offered, but refused, the position of Bishop of Rochester. During his time in England he assisted Archbishop Cranmer with his 42 Articles of Religion and the Second Book of Common Prayer. Knox spoke out strongly against the practice of kneeling at communion. When the Roman Catholic Bloody Mary came to the throne, Knox found refuge on the Continent. He spent time preaching in Frankfort and also in Geneva, where he became friends with the leading Protestant Reformer, John Calvin. In 1555 he returned for a short secret visit to Scotland, preaching at Edinburgh and in Angus. In 1556 he returned to Geneva where he became the minister of the English congregation. Knox spent four years in Geneva, which he said was ï¿½the most perfect school of Christ that ever was in the earth since the days of the apostles. In other places I confess Christ, to be truly preached, but manners and religion so truly reformed, I have not yet seen in any other placeï¿½. Following the death of Mary and the accession of Elizabeth I, Knox returned to Scotland on 2 May 1559, where he led the Reformation movement. As soon as he arrived in Scotland he preached strongly against idolatry and urged the people to turn to the plain truth of the gospel. On 11 May 1559 Knox preached a sermon against idolatry in St Johnï¿½s Church in Perth. After Knox had finished preaching, a Roman Catholic priest came into the church and began to say mass. A young Protestant boy shouted ï¿½This is intolerable, that when God by His Word hath plainly damned idolatry, we shall stand and see it used in despiteï¿½. The priest struck the boy, who responded by throwing a stone at the priest. The stone missed and hit the box holding the host, the congregation then destroyed all the idolatrous images in the Church. A contemporary wrote of Knoxï¿½s preaching: ï¿½The voice of this one man is able in an hour to put more life in us than six hundred trumpets continually blustering in our earsï¿½. Knox was a believer in education and wanted every parish in Scotland to have a school to educate the youth in true religion, grammar and Latin. Knoxï¿½s vision gave Scotland a standard of education that was probably the best in Europe. Knox spoke boldly for Protestantism saying that ï¿½One mass is more fearful to me than if 10,000 armed enemies were landed in any part of the realmï¿½. In his political views, Knox stated the duty of individuals to resist evil rulers by all means at their disposal, including armed force. His views on this matter were more advanced than those of Calvin and the other Protestant Reformers, and they had a great influence on both the English Puritans and the Scottish Covenanters of the seventeenth century. It could be argued that it was Knoxï¿½s political views that led to the Glorious Revolution of 1688.
ï¿½Scotch Literature and Thought, Scotch Industry; James Watt, David Hume, Walter Scott, Robert Burns: I find Knox and the Reformation acting in the heartï¿½s core of every one of these persons and phenomena; I find that without the Reformation they would not have been. Or what of Scotland? The Puritanism of Scotland became that of England, of New England. A tumult in the High Church of Edinburgh spread into a universal battle and struggle over all these realms; - there came out, after fifty-years struggling, what we all call the ï¿½Glorious Revolutionï¿½, a Habeas-Corpus Act, Free Parliaments, and much else! ... How many earnest rugged Cromwells, Knoxes, poor Peasant Covenanters, wrestling, battling for very life, in rough miry places, have to struggle, and suffer, and fall, greatly censured, bemired, - before a beautiful Revolution of Eighty-eight can step-over them in official pumps and silk-stockings, with universal three-times-three!ï¿½.